The event, sponsored by the Program in the Study of Spirituality and the College of Architecture + The Arts, will bring the community together Sept. 11 at MMC. When FIU’s Office of Global Learning Initiatives decided to commemorate the 10th anniversary of the 9/11 terrorist attacks on New York City and the Pentagon, organizers thought that the university’s schedule of events should celebrate people’s unity and diversity. To that end, the final event scheduled for “Unity/Diversity: Reflecting on the Meaning of 9/11” is “A Sufi Approach to Healing 9/11,” an afternoon of music, poetry, songs and whirling by Sufi dervishes on Sunday, Sept. 11. The “Sufi Approach to Healing 9/11” on Sept. 11, is designed to shine a light on what author Stephen Schwartz calls The Other Islam. The Sufis, Katz added, value that which is anti-extreme – the antithesis of militancy and politicized exteriority. 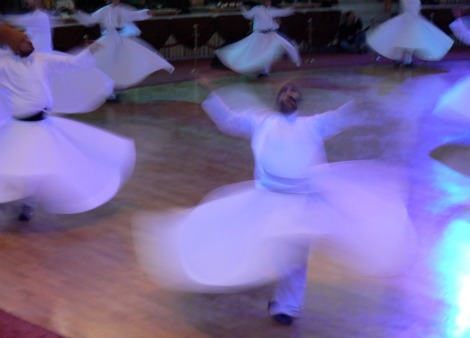 It’s love, tolerance, the worship of God, inner experience, as well as personal self-discipline and responsibility that the Sufis treasure and express through the poetry of Rumi and the unique music and whirling dance of the dervishes (seen in the slideshow below), which will be performed on campus Sept. 11. FIU will celebrate the spirit of oneness that the nation, if not the world, felt in the days following the attacks beginning Monday, Aug. 29, through an art exhibit featuring the works of Arianna Caroli. The Italian-born artist captured the American people’s resilience, as embodied in the Star-Spangled Banner, with her trusty Olympus camera, and her images will be on display on campus and at the Frost Art Museum.